Hearing aids are innovative devices, which are designed to improve your hearing. If you have hearing aids, it’s crucial to take good care of them. If you care for your hearing aids well, they should last for many years. If you’re wearing hearing aids for the first time, or you’re eager to reduce the risk of damage and keep your hearing aids in tip-top condition, here are four hearing aid care tips to take on board. Hearing aids and moisture don’t mix. 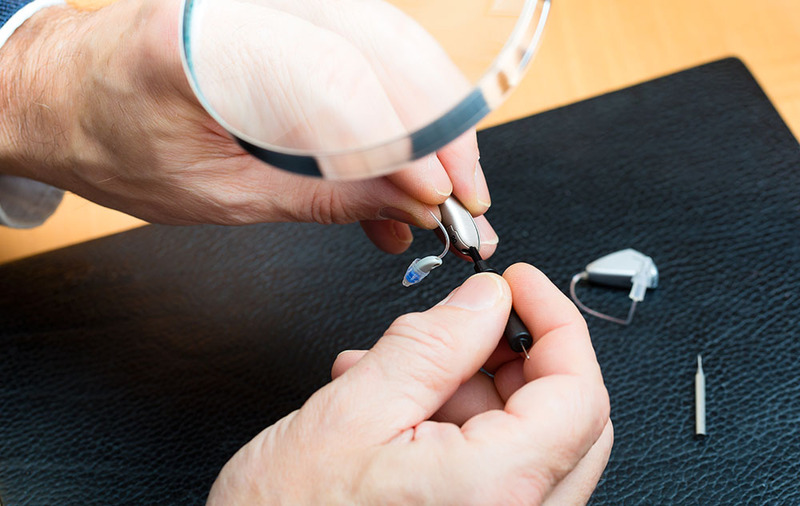 If your hearing aids are exposed to water or damp environments, this can cause damage to the delicate parts and wiring contained within the casing. Although many hearing aids are water-resistant now, they are not waterproof, and it’s always best to keep them in a dry place to prevent damage. Take your hearing aids out when you shower or go swimming and dry them immediately with a towel if they do get splashed. Avoid using a hairdryer if your hearing aids get wet, as excessive heat can also cause damage. Hearing aids are powered by batteries, which need to be replaced on a regular basis. If you leave the same batteries in for a prolonged period of time, this can have a detrimental impact, as the batteries can corrode (and of course, they’ll eventually die). When you change the batteries in your hearing aids, gently wipe the contact points of the battery to improve connectivity. If the batteries are dirty, this can hamper performance. Your body produces earwax on a continual basis to lubricate and protect the skin in the ear canal. We need a certain amount of wax, but a build-up of earwax can impair hearing aid function. To prevent this from happening, it’s advisable to clean your hearing aids on a regular basis. Take your hearing aids out and gently wipe them using a small brush or a cloth. This will help to prevent them from becoming blocked. It’s also important to change the wax filter in your hearing aid on a regular basis. Modern hearing aids are sturdy and robust, but they are not immune to damage. When you’re cleaning your hearing aids or taking them out to wash or go for a swim, always handle them with care and store them in a safe place. It’s best to place your hearing aid on a soft cloth or towel when cleaning them or changing the batteries to prevent them from falling onto a hard surface if you drop them. When you have your hearing aids fitted by your audiologist, they will give you cleaning tips and provide you with information and advice to help you take good care of your hearing aids. It’s important to look after your hearing aids to ensure you get the best out of them and to lower the risk of damage. If you have any questions when you get home, or you need advice about changing the batteries, for example, your audiologist will be happy to help.